Animal Corsa kit enters production. Fabulous new Corsa wide arch kit enters production. Special introductory fitting/painting deals - please phone for details. The kit is ideal for 17's, 18's, 19's and possibly 20's if anyone is brave enough. Visit the Animal pages for full price list. We have limited stocks of Majic colour change paint at introductory prices. Prices from £75.00 to £200.00 per litre. Full details shortly. Whilst other companies dream about cars, we just get on with building them as we have been doing since 1989. With our own fitting and painting facilities as well as the fibreglass manufacturing operation we offer an all round service that just isn't available from most other companies. We have a totally unrivalled pedigree, tons of enthusiasm, and a commitment to building the very latest modified cars. Please note - we have our own paint booths and our own paint sprayers - we do not use the local painter down the road as most companies whom claim to run bodyshops actually do. BMW MINI Animal kits enter production. Project cars being built now. NEW Universal Orimental Rear spoiler. 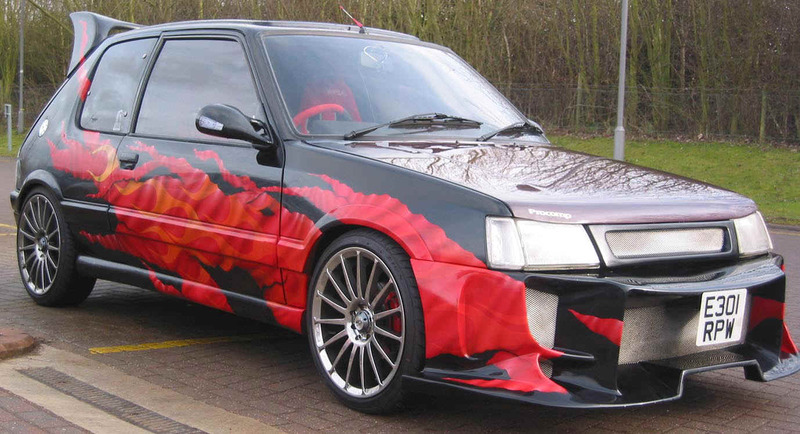 Revs 2003 Cover Car wears Autofashion Orimental front bumper. Fast Car July 2002 Cover Car styled by Autofashion. All styling for this car was a result of Phil's vision and creativeness right from the colour, the smooth door handles and taillights, and that's before you even consider the kit he invented and installed on the car!